Before you start, if you don’t have your own copy of the Grand Jeu yet, you can find a Grand Jeu de Mlle Lenormand with book for sale here . Given the Grand Jeu’s complexity, I also highly recommend you keep some notes! So, make sure you have your favorite diary or some pens and paper ready…! Now, let’s get started on how to read the the Grand Jeu Lenormand!! The first thing you need to know is that the Grand Jeu Lenormand is based on Greek mythology, and though there is a booklet on the Grand Jeu Lenormand that comes with the deck, it won’t help you delve deeper into the deck’s vast assortment of meanings. However, you can get around this by finding yourself some Greek Mythology books! The stories that we’re mainly interested in are The Argonauts (AKA: The Quest for the Golden Fleece) and The Trojan War, but there are other Myths included in the deck’s illustrations and a good reference book will really help you along. In my opinion, the Grand Jeu Lenormand works better when it is laid out in a straight line. I highly suggest picking only 3 to 5 cards (I personally go with 5, which gives you a central card and two more on each side) since there is a vast amount of information to be gleaned. Below is a brief explanation on how to read the cards. So, if you follow the example from above, you have the key card at the center. You interpret the middle card’s large drawing first, and then qualify it with the two smaller icons from the flanking cards. In other words, you define S with the small bottom-right drawing on card 1, plus the bottom-left drawing on card 2. Then you can do the same to card 2, by associating the bottom-right icon on card S, and so on. 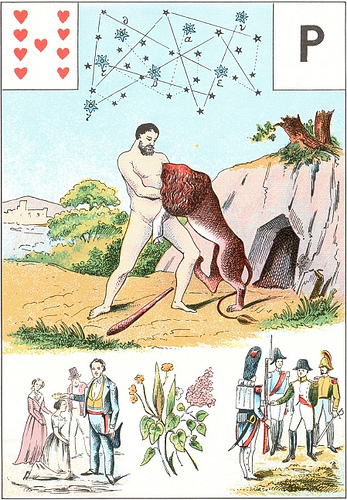 There is also an abridged version of the Petit Lenormand – Grimaud Oracle Card Deck . This particular oracle is a spinoff from the Grand Jeu, but cross-referenced with the symbology found in the Petit Lenormand. As such, it is called the Petit Jeu Lenormand. The Book traditionally means that there are secrets to learn. Possibly secret motivations. 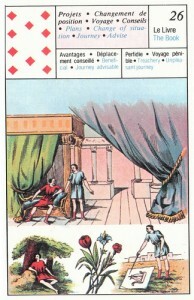 In the main picture we see Jason confronting King Pelias. Now, what you need to understand is the story behind that particular scene, which comes out of the Argonauts (better known as the Quest for the Golden Fleece). At the beginning of the story we are told that King Aeson (Jason’s father) stepped down (forcibly or not — depends on the version you read) when Jason was an infant. Consequently, Pelias was allowed to rule unopposed for several years (either as an usurper or as a regent depending on the story) until Jason comes of age… Until Jason comes of age, Pelias is king in all but name and is legally next in line for the throne should Jason meet an untimely end. Over the years, Pelias has time to prepare and consolidate his power, so when Jason does come of age he is ready. When Jason finally confronts his uncle (the scene we’re discussing), Pelias pretends to be willing to yield and give him the throne, but somehow manages to persuade Jason to go on a quest for the Golden Fleece in order to prove himself worthy of the crown. Jason, obviously too naive to realize that the throne is already his to take, starts to plan for the journey ahead of him. To Pelias’ esteemed pleasure, the quest for the Golden Fleece begins. He has masterfully manipulated Jason and is rid of the only person standing in his way. Shop around for your own Grand Jeu Lenormand …! Find out more, here ..! The small images always modify the card it flanks. So if you have cards A, B and C, then the right image on A and the left image on C influence the B (middle) card. I hope that makes sense! I had this deck given to me in 1973 when a fortune teller was reading my mum’s cards. I’d love to learn to read them. It’s certainly an interesting deck to use! I’ll see what I can do.